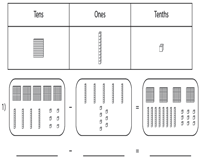 Conceptualize decimal subtraction using the strategy of base ten block models in these worksheets. 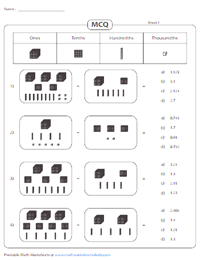 Subtract decimals to the thousandths place using the key depicting cubes, flats, rods and units given in the worksheets. Ample exercises to interpret the blocks and write the subtraction sentence involving the grouping and no-regrouping concept are included here to aid 4th grade, 5th grade and 6th grade students. Read the place value blocks, write the subtraction statement and subtract the decimals with place values ranging from tenths to thousandths to solve each problem featured here. 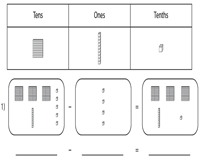 This array of decimal subtraction worksheets encompass base ten blocks to represent decimals. Observe the blocks, write the subtraction equation and subtract by canceling and regrouping blocks. A set of simple worksheets to observe the blocks, rods, flats and cubes representing decimals, subtract without writing the subtraction sentence. 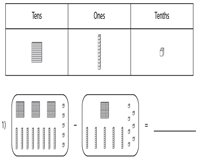 Enrich your knowledge of decimal subtraction with these practice worksheets. Read the blocks, subtract and move blocks from one mat to the other while regrouping. 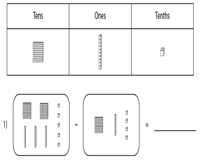 Review decimal subtraction using base ten blocks with these multiple choice questions, offering a mix of decimal problems involving the concept of borrowing and no-borrowing.